With several deadlines to meet, it was a question of what to prioritise? The National Long Term Survivors Group newsletter came top…because it was needed before the end of the week to send out with other material to the group. My Open University work came next…for the simple reason that despite it being due on Wednesday…I had already completed a draft of what I wanted to include. By Monday evening I had revised the Newsletter and posted it …as well as managing to submit an mp3 recording of my assignment ahead of time. Monday evening I attended a presentation of Titanic 100 + 1 at the Mitchell Arts Centre in Hanley. Sections of a video of the events that took place last year to mark the 100th anniversary of the loss of the Titanic were screened…together with live performances of songs and music. It was good to be part of such an amazing on-going community venture. Tuesday required an early start to travel to Manchester for a conference on HIV Commissioning organised by the newly formed North West Consortium of George House Trust (Manchester)…Sahir House (Liverpool & Merseyside) and Body Positive Cheshire & North Wales. The event was efficiently organised in the splendid Central Conference Centre that used to be Central Station. What made it so special was the careful division of presentations between the personal stories of HIV positive speakers and the factual Power Point deliveries of HIV professionals and academics. Professor Jane Anderson, Chair of the British HIV Association (BHIVA), used the event to launch Standards of Care for People Living with HIV. This document has the mandate of people living HIV in so far as they have been consulted at every stage in its creation. Another great thing about the Conference was the opportunity it gave to catch up with friends and network with commissioners and providers of services. Of course…by the time I got home I was only fit for a swift bite to eat then straight to bed. Wednesday was a bit more relaxed with time for organ practice in the morning and German class in the evening. Thursday I began work on the next section of the Open University German language course ‘Variationen’. By the end of the day I had made significant headway with the course material. At lunchtime I did my usual daily session at the piano going through the manual parts of organ pieces that I am currently working on. Since an old friend invited me to play trombone at a celebration concert for his partner who died last year…I have devoted a few minutes each day to the instrument. Progress was initially swift as old skills returned…now at a steadier pace…I am trying to improve the quality and range of notes I am able to produce. However…I won’t be looking for an orchestral position any time in the immediate future. Friday was spent mostly studying O.U. German. In the evening by contrast I sat and listened to a wonderful concert by the Halle Orchestra at the Victoria Hall Hanley with Jonathan Scott as soloist in Saint-Saens’ Organ Symphony. The hall was packed and the enthusiastic audience wouldn’t leave until Jonathan had played an encore. 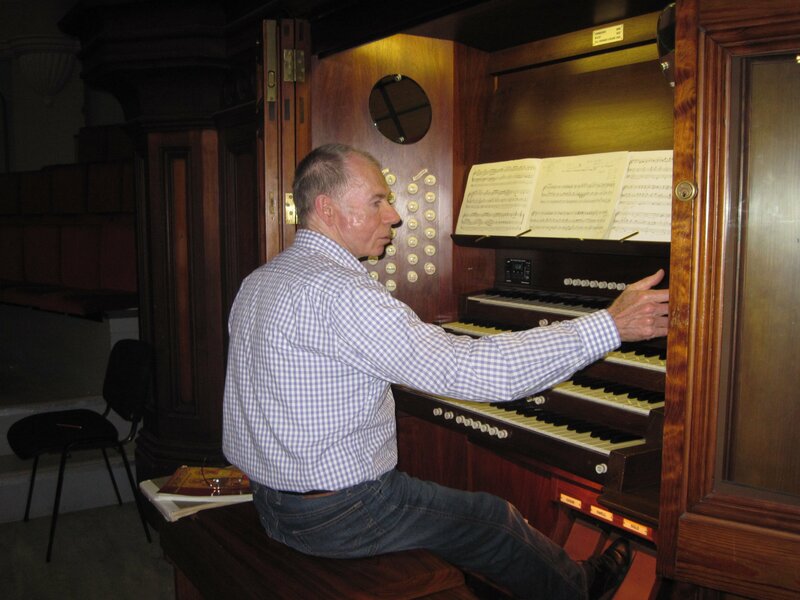 He dutifully obliged with the Toccata from Widor’s Fifth Symphony…brilliantly played and made memorable by an unfortunately out of tune pedal reed in the final section. Saturday I was able to catch up with correspondence and see to household chores…as well as preparing for Sunday’s Committee meeting of the LGBT older people’s group, of which I am Chair. There were two major local musical events on Saturday evening….the Ceramic City Choir at the Victoria Hall performed Vaughan Williams Sea Symphony…whilst at the same time in the Jubilee Hall Stoke, the North Staffs Symphony Orchestra performed Elgar’s Cockainge Overture followed by Berlioz Romeo & Juliet and after the interval Harold in Italy with Janet Pazio playing the viola solo. I attended the latter and was pleased to have supported such an enthusiastic, intergenerational group of local musicians. Now it’s Sunday. After playing for the service at church this morning, I was able to work through the Hindemith Sonata on the ATCL Performer’s Diploma list, before returning home for a quick lunch and preparation of papers for the committee meeting. It was a good meeting…but now there is more work to be done for the AGM next month. Ah well! Maybe things will become less busy when I reach 80. The Victoria Hall organ is a fabulous instrument to play…but it will be a while before I will be able to perform on it before an audience!